A promising way forward to stop the loss of freshwater biodiversity and to sustain freshwater‐based ESs is by implementing ecosystem‐based management (EBM), an environmental planning and adaptive management approach that jointly considers social and ecological needs. 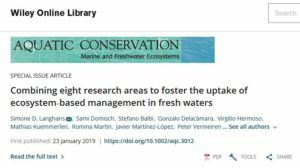 Responsible for considerable recent success in sustainably managing and conserving marine ecosystems, EBM has not yet been championed for fresh waters. A major reason for the delayed uptake of EBM in fresh waters is likely to be its complexity, requiring planners to be familiar with the latest developments in a range of different research areas. EBM would therefore benefit from becoming more tangible to receive attention on the ground. To facilitate uptake, eight core research areas for EBM and their innovations are introduced, and the way in which they feed into the workflow that guides the EBM planning stage is explained. The workflow links biodiversity distributions with ES supply‐and‐demand modelling and SMART (specific, measurable, attainable, relevant, and timely) target planning, including scenario‐ and cross‐realm perspectives, the prioritization of management alternatives, spatial prioritization of biodiversity conservation and ES areas, and the quantification of uncertainties. Given the extensive resources, time, and technical capacity required to implement the full workflow, a light and an ultralight version of the workflow are also provided. 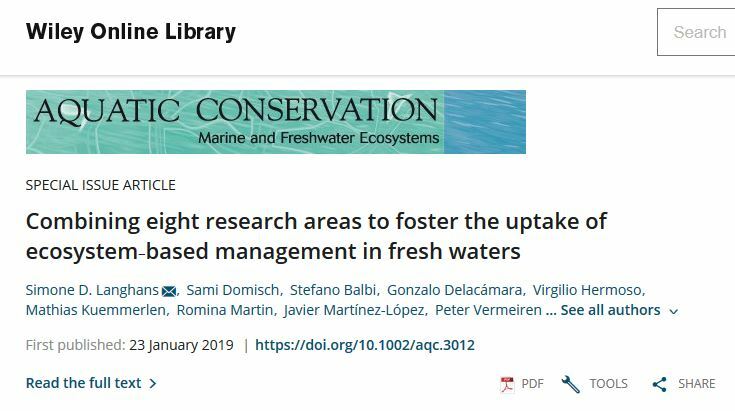 Applied in concert, the eight well‐known research areas allow for better planning and operationalizing, and eventually for implementing EBM in freshwater ecosystems. EBM has great potential to increase public acceptance by introducing the consideration of human needs and aspirations into typically biodiversity‐driven conservation and management approaches. This will ultimately improve the integrity of freshwater ecosystems.